My Sunday Photo: 26 July 2015 | Phil – Refuelled! Yesterday (Saturday) gave me the chance to escape into the countryside, where the warm weather had brought these little creatures out in force! High light levels make it easier to photograph them, as it is then possible to use a fast shutter setting and a small aperture; depth of field – the distance zone which will be in focus – is mush shallower at these close focusing settings. You’ll notice these two bees were happy to share one flower; maybe humans have a bit to learn! The colors of this image are incredible! I love it the bright lavender and the gold and black of the bee, Love it! Great shot. Beautiful photo – you’ve captured them perfectly. New blog is looking good! I think you’re right, humans have a lot to learn from those bees! What sort of settings should I be looking for? I spent some time trying to photograph bees during the week, and I’ve got a lot of fuzzy pictures! Did get one decent one that I put on instagram. One thing you should check, here: your camera should have a setting in the ‘record’ menu for AF ‘point’. Set this to ‘centre only’. What you ask is really enough for a blog post of its own… which I’ll try to do! 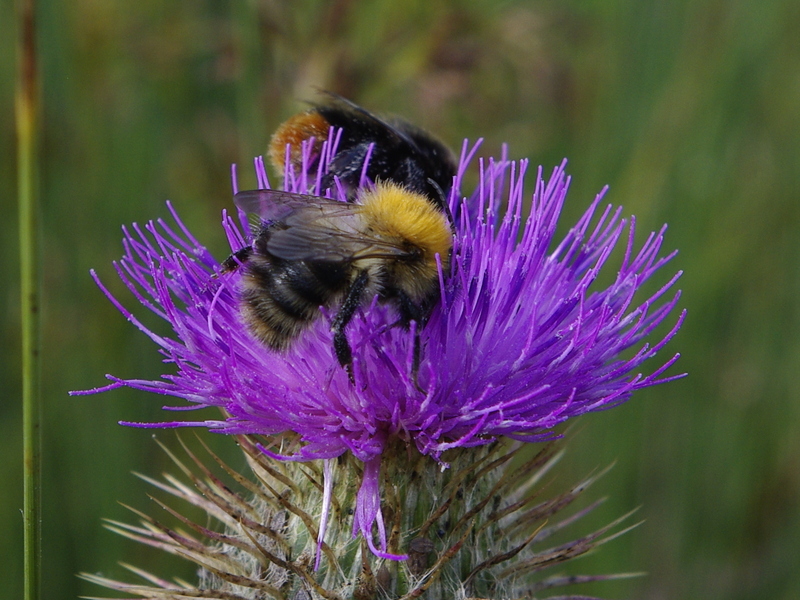 Wonderful photo of these cute bees, thistles are very photogenic, too. What a wonderful photo! You have captured so much detail! This is a fabulous shot. The colours are amazing. this is such a clever shot. who doesn’t love bees? :) and it looks great against that beautiful thistle. well done.